The Scents Sort Match-Up Kit presents little jars filled with familiar scents – can you guess which one? 30 little cups contain the smell of spices, fruits, flowers and more. Students match the smell to a picture card with the image. 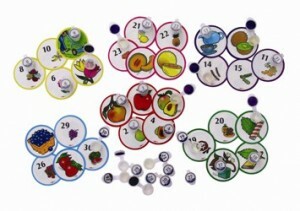 This is a fantastic game for both the classroom and at home that will lead players to wonder and laughter. Save 15% this week only on the Scents Sort Match-Up Kit by entering the Promo Code BLOGSSMK at checkout. *Offer expires on November 8, 2011 at 11:59 pm EST. Not compatible with any other offer. Be sure there are no spaces after the Promo Code when you enter it at checkout. Written by: Different Roads to Learning on November 1, 2011. This entry was posted in Difflearn Promo Code, Pick of the Week, Products, Sale and tagged Different Roads to Learning, Different Roads to Learning Sale, difflearn promo code, learning, Resources, teaching, teaching tools by Different Roads to Learning. Bookmark the permalink.